I’d Bash That: Geek goddess Naomi Oreskes [pictured] may be the hottest date on the climate scene right now, but mental mediocrity is her number 1 turnoff. Only superuser-level nerds need apply, she told Playdork Australia. The unwinnable “climate debate” has it all. Unimpeachable felons. Untouchable heroes. An unaffordable cure for an imperceptible disease. An unquenchable bonfire of irreplaceable wealth. Irreproducible “work” by unemployable jerks. The irredeemable Oreskes. The unflushable Lew. And David Appell, the science journalist who’s as ineducable as he is ineradicable. And by that of course, I mean he hit ⌘C ⌘V. Appell’s second sentence is textbook Hockey Stick Determinism (the so-called Mannifest Destiny doctrine): from first principles alone, given any big ball-shaped system, surface temperature anomaly must approach a hoccobacilliform trajectory over time as t approaches 2018 A.D. I didn’t know anyone still said this. The meme is on the IUCN Red List, so it was an awesome privilege to see a specimen up close before they all go the way of recovered-memory theory and Lamarckianism. I decided to leave it alone for a moment, so others could enjoy it too, and went after a garden-variety pest instead: the one that infests Appell’s first sentence. If only you knew how you sound to a scientifically-literate person! The fact that they don’t just pick the right mathematical technique and stick to it has never set off the faintest alarm bells for you, has it? You think it actually makes the results more convincing the more they chop and change their algorithms from paper to paper, don’t you? To you, the fact that these people apparently have a whole smorgasbord of data-analytical techniques to select from makes for better science, doesn’t it? What I was getting at, of course—but refused to repeat since It Has Been Explained To Him Several Times Already in our earlier encounters—was that the absence of standard practices for crunching observations is a recipe for vindication bias and reality evasion. To put it so einfach wie möglich: unless scientists agree on statistical tools in advance there’s nothing to stop a paleoclimatologist repeating the penultimate step of her study (raw measurements → analysed, illustrated data) with one tool after another, and choosing the one that gives the most politicogenic graph. And when I say “there’s nothing to stop her,” I mean nothing but her [don’t laugh] integrity. Now that Appell’s stupid beliefs lay in mercurial giblets like a zombiesected T-1000, I added a few stanzas of personal abuse for my own entertainment. The possibility that you’re oblivious to your own incompetence on scientific topics isn’t one you’ve wasted much time considering, is it? You’re never going to figure out why a scientist might find your quote [above] so amusing, are you? Doing things in this order illustrates one of the key habits of effective debaters: kick the ball all’a pieces first, then the man. Leaving the fun bit for dessert gives you two things. Primero, an incentive to finish off your greens. Or in Dave’s case, your fruit (har har). Secunditer, plausible deniability if anyone whinges about your ad hominem. The latter gambit is not for the ethics aficionados. (I, for example, have far too much integrity—and have never really felt the need—to avoid credit for my own rhetorical excesses.) But in case of emergency, let’s see how it’s done. Remember Naomi Oreskes’ anti-science Science article, way back in 2004? Dr Martin Schulte rebutted it, then Oreskes rebutted his rebuttal. … I AM RESPONDING TO THE CHARACTERIZATION OF THE SCHULTE PAPER AS MADE PUBLIC ON THE INTERNET. Anyone interested in gauging the honesty of Oreskes’ critique is thus encouraged to read what she’s critiquing for him- or herself, which can be found ON THE INTERNET. Simply open your browser and ask google for the web address of THE INTERNET (all caps, no spaces). 6) The blog reports describe Mr. Schulte as a medical researcher. As a historian of science I am trained to analyze and understand scientific arguments, their development, their progress, etc., and my specific expertise is in the history of earth science. This past summer I was invited to teach a graduate intensive course at Vienna International Summer University, Vienna Circle Institute, on Consensus in Science. I do not know why a medical researcher would feel qualified to undertake an analysis of consensus in the earth scientific literature. Um: because medical researchers can count? Getting warm? Is it… because they once attended a two-hour in-service on using Google Scholar? I kid. We all know medical science is perfectly respectable in its own small way, but it’s not brain surgery. Even brain surgery isn’t exactly brain surgery. Sorting papers into piles: that’s brain surgery. Finally Oreskes attempts to commit a sequitur, without luck. 7) Contrarians have been trying to refute my work for three years. A previous claim, also circulated and cited by Marc Morano, was subsequently retracted by its author. I’m told the Wienerzirkl Institut—where Oreskes not only learned how to analyze and understand scientific arguments, their development, their progress, etc., but how to realize it’s okay to be scared, because giving yourself completely to a masked Andorran duke is supposed to be scary when you’ve shut yourself off from the possibility of love for so long—has now made two semesters of Stringing Two or More Ideas Together Coherently compulsory for all BSciCon candidates, so that its alumni can lead the world in making sure nothing like bullet point #7 ever happens again. Can you imagine having to peer review this childishness? Meanwhile, on the website housing Oreskes’ metarebuttal,* the consensus of commenters—including those she once called follower—seems to be that her “obnoxious credentialism” was an ad hominem, and to that extent not worthy of a serious historian and scientist. (Heck, it’s not even worthy of Oreskes). Ad hominem: your argument is false because you are an idiot. Not ad hominem: your argument is false because of A, B, C, D, E, F, G and, oh by the way, you are an idiot. So, here’s my question for commenters: notwithstanding the undeniable flair with which this apologia is proffered, it’s wrong. Can anyone explain why a personal insult can constitute an ad hominem even when it’s delivered as a Parthian shot? How does it feel to be the only climate warrior on the ‘net (any more) who’s familiar with the science of A-Priori Hoccobacillography? What’s it like when you tell a guy like Michael Mann or Ray Bradley that pretty much his entire career in paleoclimate reconstruction was a waste of time? Paint the scene for us. When you sit down with him and show him how to derive the Hockey Stick deterministically, rapidly, without spending a cent on lawyers and using nothing but the laws of physics as pieced together by a blogger, I imagine he takes the news pretty hard at first, yeah? Do these guys ever get to a place, mentally, where they’re able to look back and have a laugh at the absurdity of life? Has a climate scientist ever called you back to thank you, and offered to buy you a drink to make up for the one they threw in your face? Cool. And would you say you’ve now become friends as a result? [Nods interestedly.] Uh-huh. Go on. Finally: have you thought about what you’re going to do with all the Nobel money? To David, Dunning-Kruger is a paper company in Scranton, PA. If only he knew it was the name of a cognitive debility. An all too real one. I’ve never told the Internet this before, but I’m a member of the DK community myself. * Nicely Illustrating one of the Six Characteristics of (Science) Denial, Oreskes has been known to bypass the peer-reviewed literature and publish her alternative theories online, frequently on blogs frequented by people frequently criticized as “flawed” by mainstream scientists. Previous post ← Met Office report — leaked or Leaked? Brad’s singleminded pursuit of Naomi Oreskes has two prongs, as I hope he won’t mind me pointing out. His obsession with Feynmannian Correctness probably appeals to about 0.1% of the population, and certainly not to Professor Oreskes. On the other hand, his approach (or courtship ritual, for the ethologists among you) though it would probably be the subject of disapproval by 97% of academia, might just work. There are species where the object of attention in an encounter of this kind will submit willingly to being grabbed at their weakest point and grappled into submission. Possibly Naomi is one of this type. I don’t know David Appell intimately, so I can’t say whether it would work with him. Many Australian mammals are monotremes*, and, having seen Appell in action against Brad at Climate Etc., something tells me that he might not submit to Brad’s advances so willingly. *If you want to know more, try Wiki. The French version contains some interesting details not available on the English language site, and the German version even has a diagram. 2OO4 and mOre. O guilt tripper deja-vu! Brad, you could say that the Appell didn’t fall far from the Yamal tree. Naomi, not to put too fine a point on it, has no fact based idea what she is saying when it comes to energy. Significant sustained industrial progress cannot take place using the wind and solar she and the other climate imperialists wish to impose on the developing world. Additionally, the command economy she seeks to impose on the world in the name of climate will work no better if the inspiration is CO2 than it has worked in the name of the proletariat. She is an utter fool who has damaged serious discussion and learning with her bigoted dogmatic version of academia. Energy, NaOmi? 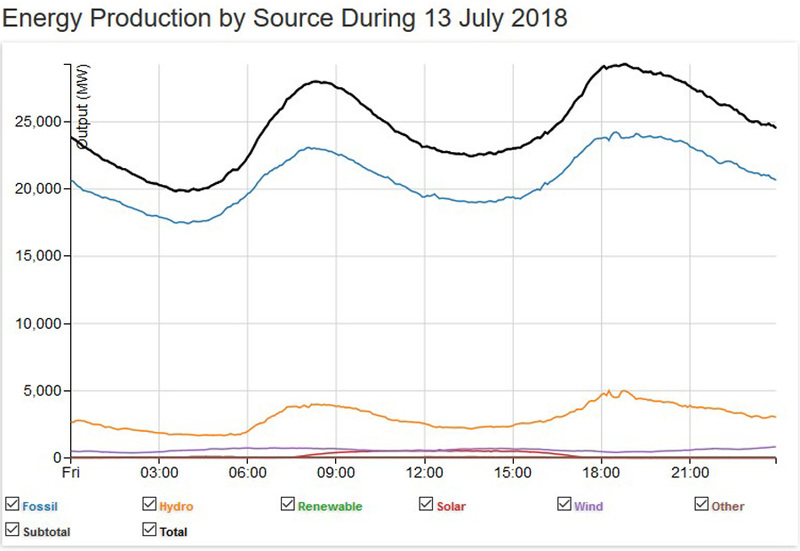 Here’s Oz daily electrical pOwer generated 13th July 2018.